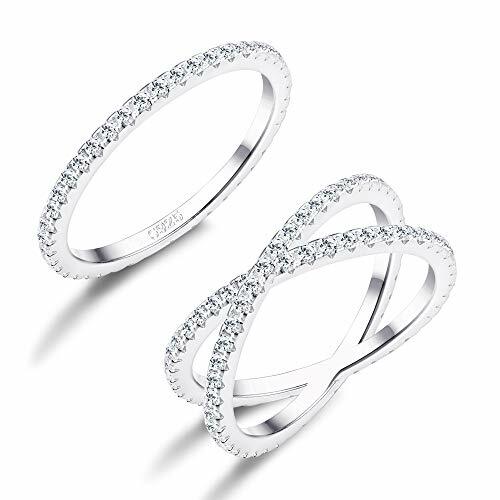 CZ RINGS SET - 2Pcs 925 sterling silver ring one set,one pcs is delicate stackable ring,one pcs is X ring.AAA+ grade clear cubic zirconia inlaid,shiny and sparkle,catch more focus on you.Wear it as engagement ring,eternity ring,wedding ring,promise rings and daily wearing. SIZE DETAIL - The cubic zirconia stackable ring is 1.5mm wide,the cubic zirconia X ring is 8.8mm wide,2MM line thickness.2 pcs all in same ring size,size 4-9 to choose,suitable for most women girls.High polished finished,smooth inner surface,which won't hurt your finger,comfortable wearing feeling. TOTAL INSPECTION - Checked one by one,total quality inspection.Great gifts for Valentine's Day, holiday, birthday,party, anniversary, prom, graduation, birthday, Christmas, Mother's Day.